For those of you who are not familiar with this award, here is a little background. It was donated by former ACS member, Roberta Barens and first presented in 2002. 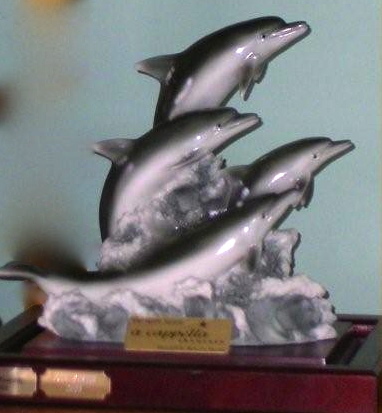 The award is a beautiful statuette of a family of dolphins, chosen since dolphins have a strong bond with their group and are dedicated to the well being of the group. They have a gracefulness and a spirit of playfulness about them and they communicate clearly but are never hurtful. The criteria that Rob originally suggested was that nominees for this award are to be recognized for always being there for the chorus, having the best interest of the chorus at heart and consistently working to ensure that things run smoothly. In this room tonight are many women who fit the criteria- hard working, always with the best interest of the chorus in mind, and who exemplify the spirit of the Harmony, Inc creed. This year there were 10 nominees. She is just delightful and the perfect person to represent our chorus. She makes everyone feel special, guests and chorus members alike. She's very kind, funny and most approachable which is an awesome quality to have in any women's organization. She is the "go to" person for new members, and she is always so friendly and helpful to them. She has been a member of the board for several years and takes her duties very seriously. She recently organized all the food for the joint chorus event, and is constantly working to ensure that things go smoothly at chorus. Her warm caring nature is just one example of her top notch people skills. Her organizational skills are enviable! She goes about her work in a quiet, unassuming manner and can be counted on when a volunteer is needed. A very warm and enthusiastic member of the chorus and always has a smile and a kind word for everyone. She is always among or is the first to the hall each week and is the last to leave after making sure that everything is orderly and neat. She welcomes every guest in her natural, friendly manner and completes other aspects of her job with care and efficiency. She also keeps us organized when it comes to arranging for treats at special times and pot luck get togethers. A wonderful ambassador for our chorus! She is always going the extra mile for the chorus as well as individual members. She is always positive and encouraging even though she has so much to deal with at home. She is the keyholder for St. George's so she is always the first to arrive and the last to leave every Tuesday. She does all of this with a smile. She is warm and welcoming to all new guests, which I'm certain is what makes many of them decide to become members. She is kind and helpful at all times. She takes a genuine interest in every member and I'm sure would give the shirt off her back if the need arose. From the moment I walked in the doors at my first ACS rehearsal, she made me feel like I belonged. Every rehearsal, she is always encouraging and her energy is contagious. She made my transition into the chorus a very smooth one and for that I am very grateful. Definitely the "spirit" ACS needs to succeed. For always making everyone feel so welcome, important and appreciated! She does so much behind the scenes that is so important and she is always so positive. She is so devoted to the chorus. She is welcoming to everyone, new singers, guests , and the rest of us and always charming and gracious. She engages every person with her sincere and warm, inviting kindness. She is just the sweetest lady I know.